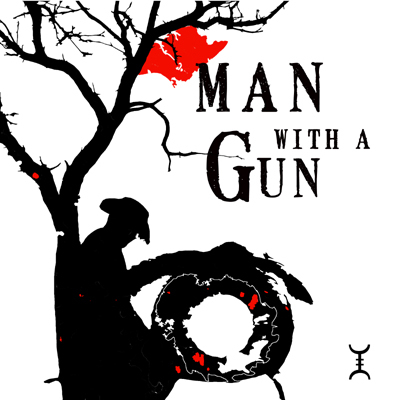 Man With A Gun is a musical exploration of the blood soaked terrain of the mythic American West. The mad bad bardos lands, a wasteland beyond life and death in which the eternal quest is pursued by those with a WILL fashioned of cold hard steel under the brilliance of a thousand sunsets. The magician is a man with a gun, one endowed with knowledge of life and death, with an ability to journey from the symbolic to the REAL gracefully, artfully, casting long shadows into the landscape left behind; only legend survives. Developed through a process of intensive psycho shamanic work that spanned over nine months, Man With A Gun is composed of 13 carefully crafted tracks created in tandem with a series of web installations and a 42 page graphic novel of the same title. Gone are maps, far away are words, only the wind speaks. View the web installations here.